In 2016, Jefferson West went 1-8 with many freshmen starting and playing key roles. Last year, the Tigers opened 2-0 with freshman quarterback Cade Ross. He and his father, former successful Lindenwood (Mo.) University coach Patrick Ross, had moved east and joined the program. Cade eventually set a school record with 1,663 passing yards. Quinn Neuenswander caught 65 passes, also a Tiger mark, and led with 536 receiving yards, sixth-best in school annals. Ross delivered at least 277 passing yards on three occasions, including 340 in one contest, for the program’s all-time single game high. Defensively, Kauli Saili picked up 93 tackles, most in the program by a lineman since 1989. However, the Tigers ended the season with seven straight losses against the No. 10 strength of schedule out of 32 Class 4A, Division II teams, according to Prep Power Index. Jeff West competed well against quality teams like eventual 3A champion Sabetha (22-7), Topeka Hayden (35-28) and Santa Fe Trail (18-0). Additionally, the Tigers fell to Holton, Royal Valley and Hiawatha with an average margin of loss of 23 points. This fall, the Tigers returned nine offensive and eight defensive starters for a heavily non-senior but veteran-laden squad. Jeff West has 10 seniors on the roster, though three get significant playing time. “We have been playing with young kids that we knew that eventually we could turn the corner,” coach Steve Johnson said. The Tigers have already avenged three losses from last season with a 14-12 road win versus Holton, a 54-14 home victory against Royal Valley and a 25-7 road win against Hiawatha. Since ’04, Jefferson West had dropped 14 straight to Holton. “They’ve took their lumps the last couple years, and now they kind of understand what we want and what the fight is about each Friday night,” Johnson said. The Tigers have a new field with high-level artificial turf that came from the New Orleans Saints. Longtime assistant coach Jake Farrant is the owner/president of Kansas Turf LLC, and coach Ross has served as the director of sales the last two years. This week, Jeff West plays host to Bishop Ward (0-3) in the Class 3A, District 3 opener. The updated Kansas classifications now feature 48 teams in 3A with six eight-team districts. The top-four teams make the playoffs. At the start of the year, District 4, with Sabetha, defending 3A runner-up Marysville and Holton, was considered the top district. However, District 3 has performed very well in the first three weeks and, even with the larger district, at least one quality squad in District 3 won’t make the postseason. In addition to Jeff West, Perry-Lecompton is 2-1 and ranked fifth in 3A. Topeka Hayden (1-2) is just outside the rankings, while Santa Fe Trail and Wellsville are both 2-1. Jeff West’s schedule is back loaded and finishes with the four stronger teams. Since ’04, Jefferson West is 0-4 against Hayden, 4-4 against Perry-Lecompton and has lost four straight to Santa Fe Trail. This is the first meeting against Wellsville, 9-2 last fall, in at least 14 seasons. The Tigers have not won more than five games since 7-3 in ’14. Ross, with his dad as the offensive coordinator and quarterback coach, has run the same no-huddle spread offense since elementary school. In 2018, he has completed 52 of 89 passes for 643 yards with an 11/2 TD/INT ratio. He has increased his yards per pass attempt from 5.7 to 7.3. Ross is able to make checks and reads at the line of scrimmage. “He has a good understanding of that,” Johnson said. The running game, with all non-seniors, averaged 3.9 yards a carry in ’17 and is up to 5.3 this fall. The offensive line has lost just one starter in the last two seasons and has only one senior this year. They’ve helped Jefferson West join Chapman, Colby and Parsons as surprise undefeated 3A squads this year. Kauli, a junior, is 5-foot-10, 290 pounds. Kauli and his brother, sophomore Pene (6-1, 225) have been standout linemen. Pene has a team-best eight tackles for loss and 32 tackles, one off junior linebacker Joel Scott for the team lead. Kauli has recorded 31 stops. Both were all-league in ’17; Pene was a rare freshman who earned honors. A third brother, Danny, is a freshman with nine tackles. The Sailis all start on the defensive line. Johnson said Kauli commands double teams and “flows up and down the line so well.” Pene is known for his quickness and penetration and play behind the line of scrimmage. The Sailis moved from Las Vegas three years ago. Las Vegas doesn’t have junior high football, so football players participate on travel club teams. The Sailis came to Meriden more experienced and higher skilled than most. Receiving-wise, the 6-2 Neuenswander has 10 catches for 136 yards but hasn’t scored yet. Sophomore 6-foot-4 wideout Josh Broxterman has suffered injury and has one catch for five yards in just one contest. JW is expected to know his updated status this week. Junior Joe Anderson leads with 17 catches. Senior Zeth Unruh has tallied 14 catches and paces with 268 receiving yards and four scores. Unruh, a good basketball player, was hurt early last year and didn’t return on the gridiron. Anderson, a smaller, quicker player, has understood the offense better and found open areas. Anderson had no catches last season, and Unruh recorded four. “Teams can’t scheme and try to take away for instance Quinn, if they try to do that, then we have other guys,” Johnson said. Galena appears the be the district favorite on paper, but the Bulldogs will have to play their most challenging district games away from Abbey Field. Still, Galena’s experienced backfield of JC Shelton, Joseph Helton, and Kooper Lawson makes them the favorite. Last year’s Class 4A-II state runner-up Frontenac has broken in several new starters with a tough schedule that included wins over Richmond (Mo.) and Commerce (Okla.). The Raiders’ lone loss came to rival St. Mary’s Colgan in wet, muddy conditions in Week 2. Parsons may be the most explosive team in the classification, but the schedule will certainly get more difficult in district play. The Vikings last playoff appearance was in 2011. Caney Valley has been to the playoffs eight straight seasons, but the Bullpups will face their toughest district draw in some time. Columbus has been a consistent contender in recent years, but may be facing a rebuilding year. Still the Titans will absolutely challenge for one of the top four spots in this district and can go a long way in securing a playoff spot with a win against Caney Valley this week. Baxter Springs has been improving under coach Tim Parrish, but the Lions have not reached the postseason since 2006. District 2 appears to be top-heavy with Burlington, Girard, and Prairie View expected to grab the top three playoffs spots. All three of these teams have suffered losses quality teams. Girard and Prairie View each lost to District 1 favorite Galena. The Bulldogs defeated Girard 36-2 in the mud, and beat Prairie View 50-22 last week. Meanwhile, Burlington was shutout 31-0 by 1A No. 4 Olpe. After Connor Jeffers rushed for more than 2,000 yards last year, Burlington has replaced his production with a combination of Brannon Nordstedt (372 yards) and Cael Johnson (272 yards). Prairie View continues to make strides under second-year coach Kyle Littrell. The Buffaloes are experienced with 15 total starters returning from last season including standout junior Hunter Boone. Another competitive district where five teams will battle for four playoffs spots. Despite a 1-2 record, Topeka Hayden will be a factor. The Wildcats have dropped consecutive games to quality larger schools in Topeka Seaman and Washburn Rural. Perry-Lecompton proved last week that they are a contender in Class 3A. The Kaws took defending 3A champion Sabetha to the wire in a 35-33 loss – coming up short on a two-point conversion attempt with under a minute remaining. Perry-Lecompton all-stater Dalton Kellum continues to impress in averaging more than 210 yards per game on the ground with ten rushing touchdowns. Jefferson West is seeking its first playoff appearance since 2013. The Tigers are off to a perfect start with wins over Holton, Royal Valley, and Hiawatha. Jeff West returns 17 total starters with experience including some size up front and sophomore quarterback Cade Ross. Pioneer League members Santa Fe Trail and Wellsville will also challenge for playoff position in this district. Wellsville graduated some talented players from a season ago, but quarterback Zach Vance has proven an effective passer through three games. Meanwhile, Santa Fe Trail is getting things done on the ground with Will Heron who is already closing in on 500 yards rushing. Bishop Ward is looking for any momentum in attempt to turn around a program stuck in the midst of a 40-game losing streak. What better way to open district play than with a rematch of the 2017 Class 3A state championship game between Sabetha and Marysville. The Bluejays’ late interception last fall secured a 7-6 win in the title game. Sabetha has now won ten straight games including last week’s 35-33 thriller over Perry-Lecompton. The Bluejays feature on of 3A’s best backfield with the likes of Gabe Garber, Joe Gruber, and Mason Engelken. Meanwhile, Marysville graduated all-state quarterback Jack Blumer with junior Brandon Schroedl stepping in nicely. Schroedl has passed for 523 yards and five scores this season, and returning all-state receiver Jacob Backus remains a primary target. Traditional power Holton may have been written off by some after consecutive losses to open the season in which they scored only 12 total points. Last week, the Wildcats regained their form with a 37-32 victory over Nemaha Central. Wamego has opened with victories over Concordia and Clay Center sandwiched around a loss to Chapman. New coach Weston Moody will try and get the Red Raiders back into the playoffs for the second consecutive season. Hiawatha is looking for its first playoff appearance since 2013. The Red Hawks have dropped consecutive games after a win over Riverside to open the season. Royal Valley also has a win over Riverside, coming in the closing moments last week. Much of the district hinges on the return of Hesston’s electrifying backfield duo of quarterback Cameron Cox and running back Parker Roth. Cox has not played this season with a knee injury, and Roth missed last week in a 55-0 loss to Pratt, the first time Hesston has been shutout in the regular season since ’09. Cox and Roth return, Hesston maybe the favorite in the district. If Kurt Webster has led a big turnaround in his second season at Chapman with a run-heavy attack paced by quarterback Izek Jackson, fullback Dalton Harvey and linemen Kel and Kobey Stroud. Last week, the Fighting Irish ended a five-game losing streak versus rival Abilene. Halstead junior Scott Grider has delivered 49 carries for 419 yards and six TDs, all team-highs, along with a punt return TD. Halstead has to travel to Hesston and Smoky Valley. Smoky Valley’s run-heavy attack graduated Kyle Anderson after he exceeded 1,300 rushing yards the last two falls, but has ground out 317 yards a game this fall, mainly behind senior Tim Lambert, Jr. (370 rush, 8.2 yards per carry). Clay Center and Rock Creek are a combined 0-6. Andale, led by its host of talent and depth including South Dakota commit Mason Fairchild, has been ranked No. 1 all year. The Indians have outscored opponents 132-14. Cheney went 9-3 last season and has started 0-3 but has faced Garden Plain, Conway Springs and Chaparral, all ranked in the top-5 in Class 2A. The Cardinals have been competitive in each game with losses by three, 21 and 28 points. Wichita Collegiate opened the year with a 32-0 loss to Wellington, the first loss to the Crusaders in school history. The Spartans have won their last two by a combined 78-25. Clearwater owns a four-point win at Rose Hill before losses to Mulvane and Wellington the last two weeks and gets the nod over Haven (1-2) and Wichita Trinity (0-3) for the final slot. 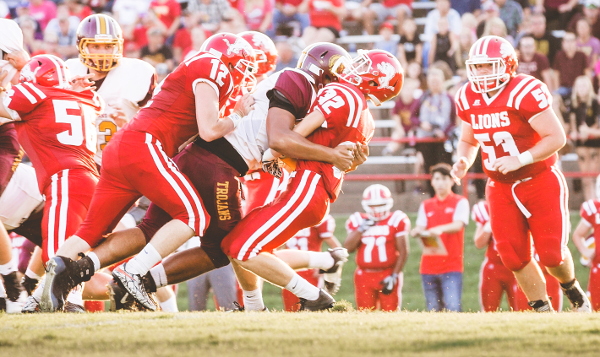 Pratt has moved into the top-5 and been one of 3A’s most impressive teams with quality victories against Hoisington, Halstead and Hesston in Central Kansas League play. The Greenbacks have averaged 375 rushing yards a contest. Seniors Travis Theis and Kadence Riner have combined for 53 carries for 781 yards and 14 scores. Holcomb, the defending 4A-II champion, ended a nine-game winning streak versus Colby last week and fell to rival Scott City in Week 2. The Longhorns had virtually a complete retooling of its team, especially offensively. Senior quarterback Peyton Ortner has accounted for 539 yards and seven scores to lead the offense. Nickerson is 0-3 with first-year coach John Wellman but has competed well against a brutal schedule with losses by 15, 14 and two against Halstead, Hoisington and Smoky Valley. Kingman, known more for defense, has averaged 33.3 points a contest in a 1-2 start. The Eagles tallied 18.4 a game last fall. Larned and Hugoton are both 0-3. Scott City, like Andale and Pratt, has looked especially impressive with three shutout wins. The Beavers have significant talent, led by senior running back Wyatt Hayes and junior quarterback Parker Gooden. Scott City is the lone 3A squad to not allow a point through three games. Beloit, which hosts Colby in Week 4 in a key matchup, has only a one-point road loss to Southeast of Saline in Week 2. Colby earned a milestone win versus Holcomb last week and ended a nine-game losing streak in the series. Back Jordan Schippers is one of the state’s top players. The Eagles have lost 10 in a row to Scott City dating back to ’04. Russell is 2-1 under first-year coach Jordan Echer, and similar to last year, has been great with big non-offensive plays. The Broncos have four non-offensive touchdowns, forced eight turnovers and stand at plus-five in turnover margin. Concordia is 1-2, while Goodland is 0-3.